Archaeologists found ashes from one of the largest volcanic eruptions in recorded history during excavations some 270 kilometers away in an ancient city that has developed to become Turkey's third largest. Now located in the heart of Izmir's Bayraklı district, the ancient city of Smyrna, established 5,000 years ago by the Greek tribe of Aeolians and later inhabited by Ionians, was an important port city and trade outpost on the coast of the Aegean Sea with good inland connections. It was mostly abandoned after it was captured by the Anatolian kingdom of Lydia in the 6th century B.C. when Alexander the Great and his commanders decided to re-establish the city on a larger hill located south of the Gulf of Izmir in the 4th century B.C., which formed the basis of modern Izmir, and the old city came to this day as a mound located some 500 meters inland. The site has been excavated continuously since the late 19th century with scientific excavations starting in the late 1920s during the early periods of today's Turkey. A new excavation in the old Smyrna was launched in 2007 and managed to reveal various important findings since then, including the latest discovery of ashes from the Minoan eruption that took place some 3,600 years ago. Professor Cumhur Tanrıver, the head of the Smyrna excavation team, told Anadolu Agency that the ashes would shed light on Izmir's history. "In this year's drilling work, ashes from the Santorini Volcano have been found, which is known as the Minoan eruption in history and the largest volcano explosion in 10,000 years," Tanrıver said, adding that the ashes have been tested at the Geography Department of Ege University. Tanrıver noted that the volcanic explosion in Santorini spread ashes in the region and triggered tsunamis throughout the Aegean, causing the Minoan civilization in Crete to collapse. "Once the ashes are examined, they will provide us the opportunity to see what changes the explosion caused in Smyrna and how it affected the people their culture. It will be an indicator like a touchstone. We will also be able to chronologically rank some events in Smyrna that for which could not set an exact date before," he said. 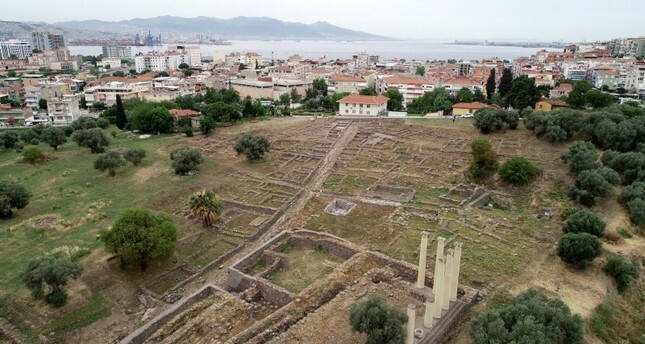 Tanrıver said the first house belonging to Greek culture has been discovered in Smyrna excavation, allowing academics to understand how people were constructing houses at the time and the city planning. "The earliest written work in the Aegean was also discovered here. The Temple of Athena, considered the first large Greek temple in Anatolia, is also located here," Tanrıver said. Some 100 people, including academics and experts from Turkey and abroad, are taking part in the Smyrna excavation.